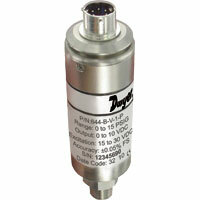 The Dwyer Series 644 Industrial Pressure Transmitter is a robust transmitter designed for high accuracy pressure applications. Boasting an accuracy of ±0.05% FS RSS (<±0.25% TEB), the 644 is intended for precise measurements in the critical applications of calibration technology, hydraulic/pneumatic controls, and many more laboratory and industrial settings. The Series 644 offers multiple measurement options with two output choices (VDC or mA) and ten psig pressure ranges (optional 0 to 15 psia). The robust and compact all stainless steel Series 644 is available with either a 1/4" male NPT, or 7/16"-20 male SAE process connections. Each transmitter is provided with an 11 point NIST traceable calibration certificate. Wetted Materials: 17- 4 PH SS. Total Error Band (Includes all thermal effects):<±0.25% FS over entire temperature compensated range.Stability:<0.15% FS/year. Temperature Limits:- 40 to 185°F (-40 to 85°C). Pressure Limits: Proof pressure and burst pressure: See pressure limits table below. Compensated Temperature Range: -4 to 140°F (-20 to 60°C). Power Requirements: 9 to 30 VDC for current output; 15 to 30 VDC for voltage output. Minimum Supply Voltage: Min. supply voltage (VDC) for current output = 9 + 0.02 x loop resistance Ω (loop resistance Ω = line resistance + receiver resistance). Output Signal: 0 to 10 VDC (4-wire); 4 to 20 mA (2-wire). Response Time: <10 ms (voltage output), <80 ms (current output). Max Current Consumption: 4 to 20 mA: 22 mA; 0 to 10 VDC: 20 mA. Electrical Connections: 3 ft cable or 6-pin male bayonet connector. Process Connection: 1/4" male NPT or 7/16"-20 male SAE with O-Ring. Enclosure Rating: NEMA 4X (IP65).Mounting Orientation:Vertical. Weight: 9 oz (254 g).